An Otago polytechnic graduate, our nurse Jen has been with us since Aug 2012. Jen is currently acting practice manager while Mel is away on maternity leave. 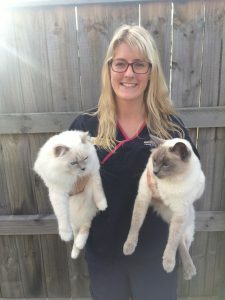 Jen will ensure that your companion’s visit to CareVets Kapiti is as stress free as possible while in the hospital or in consultation with the veterinarian. She enjoys living in the Kapiti Coast with her husband, toddler and two ragdolls “Sarge” and “Kairos”.